Harvesting is done in the early hours of the morning when ambient temperatures are low. Bunches of grapes are carefully placed in a single layer in crates and are kept in the shade. grading bunches as per size and colour are undertaken. Those falling short of preset parameters and standards are discarded. Pic: Corrugated Boxes used to pack grapes. The Infrastructure at one of the member societies. Grapes are pre-cooled to 2 degrees C to prolong it's shelf life from 60 days to 90 days. Each of our member societies are provided with a pre-cooling unit. Pic: Grapes Precooled by forced-air cooling method. with perforations to allow cool air to pass through. The boxes are palletized to facilitate easy handling. of an Central Excise & Customs supervisor. grapes leaving for the port. Thereafter, the boxes containing the grapes are stuffed in the container. 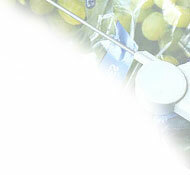 Prior to stuffing the conditions of the grapes are checked by surveyors appointed by the shipping companies. The container is then sealed by Central Excise and Customs Inspector. various destinations as per the directives of Mahagrapes.